This is addon announces in chat when you interrupt a spell. It is lightweight and fully configurable. To bring up the configuration interface, type /ai or /announceinterrupts. You can also reach it through the interface options. 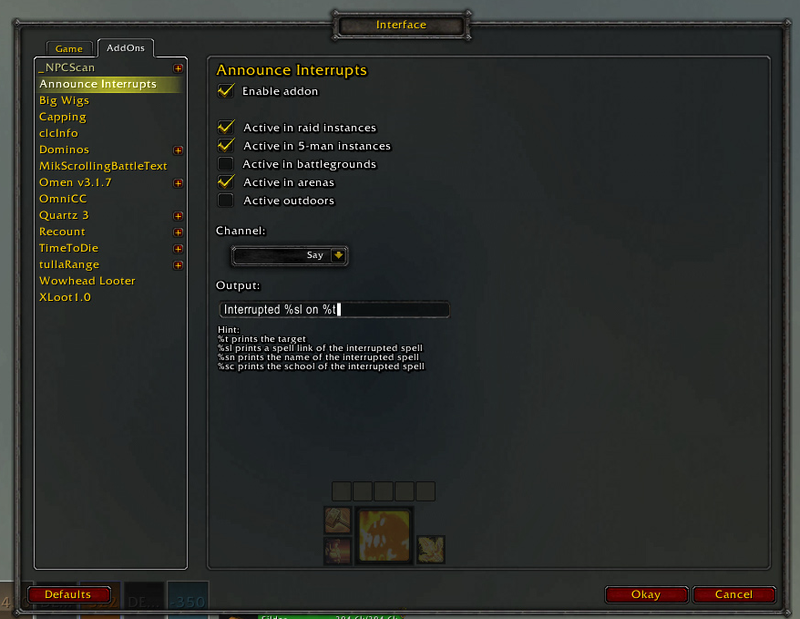 In the configuration you can choose where you want the addon to be active (raids, party instances, BGs, arenas, etc. ), as well as the message to be printed when you interrupt and which channel to print it in. Interested in translating my addons? Send me a PM! Ran into a chat problem after changing my announce channel options from say to instance. No errors but it broke my chat after 1 interrupt that should have been announced. It wasn't announced and anything that I tried to chat to any channel (guild, whisper, say, yell, party, whatever) could be typed in but when I got enter to send the chat, it wouldn't send and it would ignore the enter key. Error when pressing Combo in Settings, where Output channel is selected.